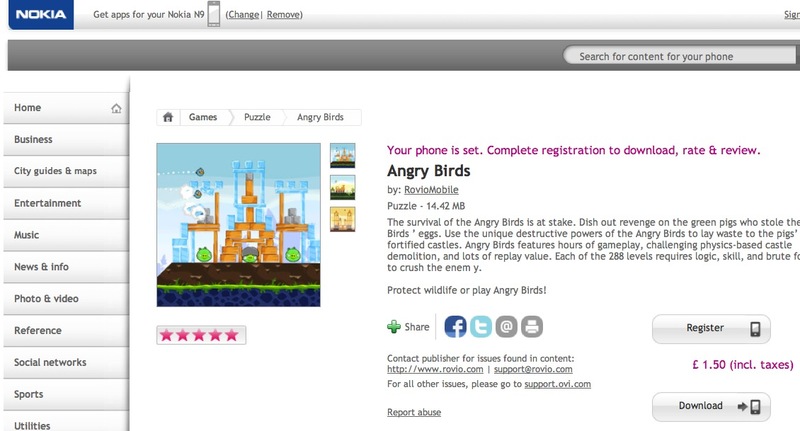 Angry Birds Full Version Now Available for N9! It’s been said that a OS isn’t considered an actual eco-system/A real OS until it has Angry Birds on it, well MEEGO can now officially join the ranks of the big guys; as the full version of angry birds (all 288 levels of time wasting-exam failing- attention grabbing- obsessive goodness) is available at the Nokia store for the usual 2 pounds (Except for Symbian where it’s free as part of the Nokia store promotion) – previously only the ‘Angry birds NFC magic’ was available. Side Note: Anyone know what the last line in the game description means? “Protect wildlife or play Angry Birds!”??? Why can’t we do both?? Thanks to DsMobile & ZiiimZooon for the tip.